It was a story about loss, and persistence, and restoration. 1. He wept bitterly, until all of his strength was gone. 2. He then found strength in the Lord his God. 1. He repented, for his sin AND the sin of his people. 2. He interceded. He took the promises of God’s word and brought them before Him all the more. 3. He gave thanks. He gave thanks for what He had done and what He would do. He thanked Him for His promises and covenants. Both of these men could have given up. They could have stopped. They could have taken the freedom God gave them, and hidden themselves away. They never would have gotten the promises of God fulfilled in their lives. Instead, they were persistent. First in their belief that God would care for them, and then, in their tenacity to continue moving forward, through pain and loss, to receive the prize at the end of the line. Will we go on until we reach the prize? To be sure, there are prizes here on this earth that are worth fighting for, but in reality, they will all fade away. My persistence will lead not only to some of these, but to the ultimate prize – Living in the Presence of God. In His kingdom. Forever. Pretty sure of this am I? A reading for my grand children, and for you as well. Johnny Smith: I’ve been tutoring this boy named Stuart. In the vision, I saw him drown. But that’s not the point. In the vision, something was missing. Dr. Sam Weizak: How – how do you mean? Johnny Smith: It was like… a blank spot, a dead zone. Dr. Sam Weizak: First of all, tell me, did the boy, in fact, drown? Johnny Smith: His father wanted him to play hockey. I talked him out of it. The boy’s alive. Johnny Smith: I can change it. Dr. Sam Weizak: You can change it, exactly. Here. Yes, John. That is your… your “dead zone.” The possibility of… of altering the outcome of your premonitions. It’s fascinating. Let me make a note. The thing he couldn’t see, the thing in the shadow, was what thing he could change. It can come as an encouragement, or a warning as in this example. If God has given you a prophecy, a word, a knowing; then you can always count on it, no matter what you see with your eyes. If you have behaviors or thoughts that take you consistently away from that promise, you can change that. That dead zone is a place where you can change things. Change them by hanging on, getting stiller, listening longer, and waiting for the answer to come from the shadow. If He has said it, He will do it. Things will change. Hold on. And soon; Isaiah 9:2 The people who walked in darkness have seen a great light; those who dwelt in a land of deep darkness, on them has light shone. Even if the days seem dark, we have a promise. We wait, and walk, and wait some more, with Him, to see His promise fulfilled. Well, as you can see, I’ve been exploring my past through blog posts from long ago. Hopefully, prayerfully, these Friday looks into the past will help create questions in you, and a longing to find the answers you need, finally. I’m here cheer you on! This past Sunday our Community Hour Class began its summer session; “Proverbs; Making the Wise Wiser”. During the introduction, we were each asked to answer a couple of questions around our table. These questions were meant as kind of an ice breaker, and a lead right in to the topic we are studying. Well they were ice breakers to be sure, but to me one of these questions was so much more. It sent me on another journey, into the background that makes me who I am. All of the time I have spent on introspection, I would like to think that it is all finished. As we have spoken of in a previous post, it will not be finished as long as we are here on this earth. However, our Merciful Father in Heaven will allow no more than we can handle at any one time. Each journey into our background and back out again, carries with it another piece of healing, filling in the puzzle that is us. 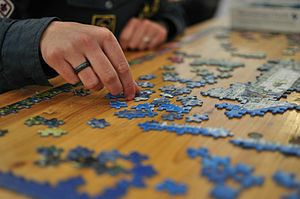 Have you ever been putting a puzzle together and many pieces go together quickly? Have you noted that in the very same puzzle, some can take a long time to place? Each of these remaining pieces needs to be inspected. If you do not enjoy the process, you probably will never finish the puzzle. The question we were asked, seemed very innocuous at the time it was asked, but the more I reflected on it, the more I could sense that this would not be over, just because the class was. This piece would have to be investigated closely. * How many lived in your home when you were seven? * Who was the warmest person in your life at that time? What I soon realized, was that I could not remember even one “warm” person in my life. Were people supposed to be warm? The only thing that came to my mind was that during my very young life, we used to travel every Sunday to my Grampas house in the country. While there, I would climb the apple trees in his orchard and visit the hay mow in the barn. Life was peaceful if only for a short time. After dinner, I can recall clearly, sitting on my Grampas lap in his big comfy chair, eating popcorn out of an enamel roasting pan and watching Lawrence Welk. I believe that was the safest, coziest, warmest spot I ever knew. When the show was over, it was time to load up and go home. My heart longed for our return the following week. Those visits came to an abrupt end, when there was a misunderstanding between my Father and my Grandpa that got me a beating that today would have landed me in the hospital and my Father in jail. Father never apologized and Grandpa would not let him return until he did. I never got over the fact that it was my fault that we could not visit any more. My warm person/spot was gone. Grampa came to town to live with us several years later, after my Grandma died, and my Mother and Father divorced, but our relationship was never the same. I knew it was my fault. I didn’t find out until much later why it had changed so drastically, and that was that I had grown up, and he didn’t feel that hugging or snuggling with a girl my age was proper. But the damage was already done. So. After class, I was compelled to come and go through the family photos left here by my Mom. There I found snapshots of brief moments of family life. Brief shots. Brief smiles. 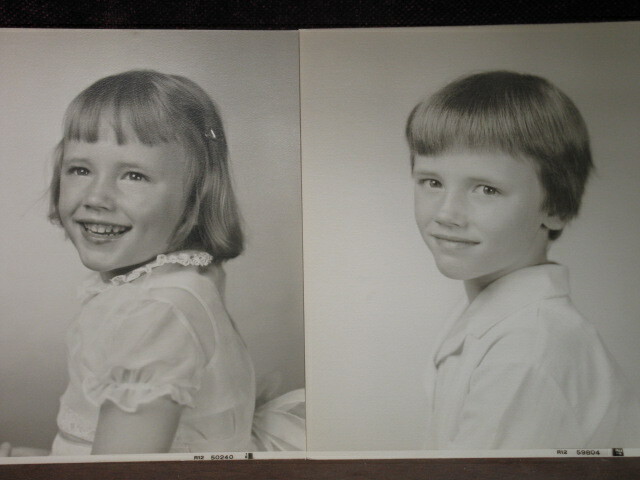 I also, sadly, noticed that in nearly all of the photos of that time period, the smile never went to the eyes. That sounds strange maybe, but it was there. I saw it. Here are two photos I found of myself. In one of them, my favorite one, I was four. See the light in the eyes? They twinkled. I think this may have been before I found out I was defective. See the second photo? Age seven. Sad smile. No twinkle. I’m still processing what I see. I’m still examining every piece. With God’s help, and His alone, I will be able to fully place the truth, and go on to another piece. 13 For you created my inmost being; you knit me together in my mother’s womb. 14 I praise you because I am fearfully and wonderfully made; your works are wonderful, I know that full well. 15 My frame was not hidden from you when I was made in the secret place. When I was woven together in the depths of the earth, 16 your eyes saw my unformed body. All the days ordained for me were written in your book before one of them came to be. Do not be afraid of the process. Join me in placing the pieces where they rightly fit. 32 And ye shall know the truth, and (He) the truth shall make you free. I once believed that if I “thought too highly of myself” it was a sign of selfishness. I was told I thought more highly of myself than I ought. I once believed that stating my abilities was bragging about how good I was. I was told I was a show off, and that I needed to stop it. I once even believed that if I tried to show any of these talents, then people would tell me I was wrong, and that I actually had no talent at all. Sadly, they told me this, all through my life, and I believed them. Many times these declarations came from those who were either supposed to look after my well being, or if not them, then from someone I had dared to step out of myself to trust. I was taught that “I” statements, should be phrased as “we” statements. Hence, I would not be attracting too much attention to myself. Even my journals were phrased in this way. I may not know you, but I do know something about people, and even a little bit about what makes them tick. May I just start by saying that when we are small, and then even as we grow, we have the ability to be either weak or strong, healthy or sick, bright or dim, positive or negative. Of course a lot of this comes from our genetic code, but I believe much, much more of it comes from what we are told as we grow. 2 Corinthians 10:5 says that – We capture every thought and make it give up and obey Christ. The Living Bible translation says that we can capture these rebels (thoughts) and change them into thoughts whose hearts’ desire is obedience to Christ. By re-working how I think in this way, I can choose God’s thoughts for myself. I have it on good authority (God’s word) that it is OK for me to declare what God has put in side of me. By declaring this truth, I am actually strengthening and re-strengthening the fact for my heart to know that I am fearfully and wonderfully made, I am choosing an obedient thought instead of a lie. When I capture all those negative thoughts placed in my mind, I literally take them, and trade them in. I don’t like those thoughts, and like returning a purchase at the store, I’ll choose some other thoughts. I’ll choose the thoughts that God has thought about me all along. I’ll choose the ones I was not able to hear for all the untrue ones that were loudly going off in my head! We become His “Show and Tell”. What day was more exciting than “Show and Tell”? When we could share our most prized possession with the class! He is excited to show us off! He absolutely loves what He has created! He wants the world to see! People will see and know that we belong to a loving Creator God. Now you may or may not know much about this God of whom I speak. Whatever the case, please allow me to give you some of God’s own words to let you know and realize the way He thinks of you, the way He sees you. Please allow God’s words for you, seep into your heart. Please allow them to marinate your person with His extreme love for you. I’ve given you a dozen verses to consider. Then you may even wish to consider your own. · Ephesians 2:10 For we are His workmanship (poem, creation, show and tell), created in Christ Jesus for good works, which God prepared beforehand so that we would walk in them. · Romans 8:38-39 (NIV) For I am convinced that neither death nor life, neither angels nor demons, neither the present nor the future, nor any powers,39 neither height nor depth, nor anything else in all creation,(nothing!) will be able to separate us from the love of God that is in Christ Jesus our Lord. · 1 John 3:1-2 (NIV) See what great love the Father has lavished on us, that we should be called children of God! And that is what we are! (Tweet that!) The reason the world does not know us is that it did not know him.2 Dear friends, now we arechildren of God, and what we will be has not yet been made known. But we know that when Christ appears, we shall be like him, for we shall see him as he is.3 All who have this hope (Yep. You again!) in him purify themselves, just as he is pure. · 2 Timothy 1:7 (KJV) For God has not given us the spirit of fear; (Fear not, listed 365 times in scripture – One for each day!) but of power, and of love, and of a sound mind. · Psalm 57:2 (AMP) I will cry to God Most High, Who performs onmy behalf and rewards me [Who brings to pass His purposes for me and surely completes them]! This is all I have for you today. God so wants to make these truths real to you. Won’t you give Him a try? First I’ll share what I wrote, then show you why I’m happy just how I am. Here is what I wrote, 5 for 5 Brain Dump style. If you don’t know what 5 for 5 Brain Dump is, Click here to find out more about it. There was a little girl, who spent most of her time alone. She never really minded being alone, when she was really small. She played in her mind with imaginary farm animals, and ballerinas. Ballerina milk maids made her smile. As she grew, she found that other children had not spent time alone, but rather, played with their friends. So she tried to make friends, only to find that they were not nearly as friendly as her imaginary ones. In fact, they were mean and bully-ish. She switched again, back to playing alone, and found herself quite happy to do so. For that I am grateful. For she, is me. Those years of playing alone, I was really quite content, but it weighed heavy that I didn’t appear to fit in with all the others. For you formed my inward parts; you knitted me together in my mother’s womb. I praise you, for I am fearfully and wonderfully made. Wonderful are your works; my soul knows it very well. My frame was not hidden from you, when I was being made in secret, intricately woven in the depths of the earth. I am, as are you, exactly the way that God planned for us to be. He has a plan for us. Whether we are happy being quiet, or happy being in a boisterous crowd. I have learned to enjoy peacefulness in a way that others cannot. Quietude. I can function quite well in a crowd, but Quietude calls my name. People. We’re all the same. We want to be known. Here I am sharing my experience with just one of the multitudes of ways we can make this happen. The pay is so often not monetary. The look in a young mothers eyes when here child can safely live in her room again, without becoming sick. An American Veteran who has served well, but now must rely on his sister for even the simplest of tasks; bathing or being able reach the sink to brush his teeth. The elderly woman who the only thing that stands between her and leaving her lifetime home for a nursing home, is bad plumbing. Or the family whose life is forever changed when daddy has a collision with a deer, and will never walk again. These are real stories. We tell them again and again. Because WE, can make a difference. We can help, and I’ve since found out that even the little guys like to help. You may not have Rebuilding Together near you, but you probably have Meals on Wheels, or some other source of senior resources, or even a shelter of some sort. They can all use your help. Talented or not, it doesn’t matter. I encourage you to go out and do something for someone today. Believe me, you’ll be helping your own soul as well!